Are you deep frying a turkey and wondering how to make gravy for it? You totally can! You don’t need the roast drippings to make delicious gravy. 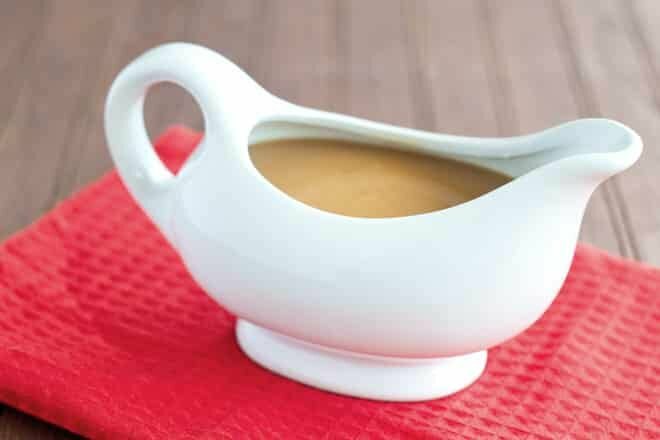 Learn how to make gravy without drippings here. Also, learn how the same technique can be used to make an easy make-ahead gravy so that your roast dinner prep is a breeze. This post is sponsored by Swanson®. You can’t have Thanksgiving Dinner without gravy. You just can’t. And yet, there are times when gravy is hard to come by. For instance, if you deep fry your turkey, then you don’t get drippings from which to make that luscious turkey sauce. Also, if you smoke or brine (or both) your turkey, the drippings can be really salty and not usable at all. So how do you make gravy for a deep-fried turkey? Or in any of these cases. Before I continue, a quick sidebar in case you’re feeling lost and have no idea what drippings are. Drippings are the liquid that accumulates at the bottom of the pan when you roast meat. That liquid cooks in the bottom of the pan along with the roast. 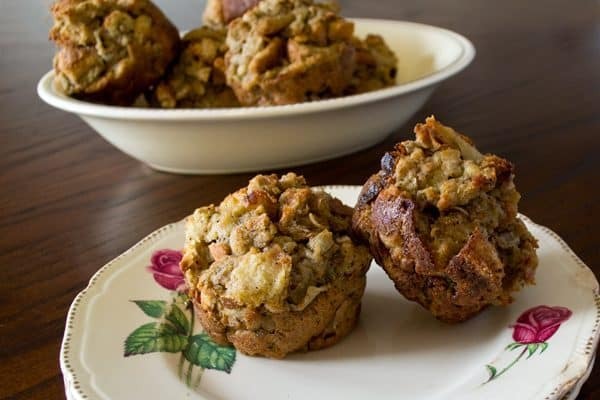 It caramelizes and browns and takes on a really rich flavor. Drippings are usually at the heart of gravy-making and you can see a classic gravy recipe made with drippings over here. You typically would make a paste out of some fat, like butter, mixed with flour. Then you’d slowly stir in those drippings. 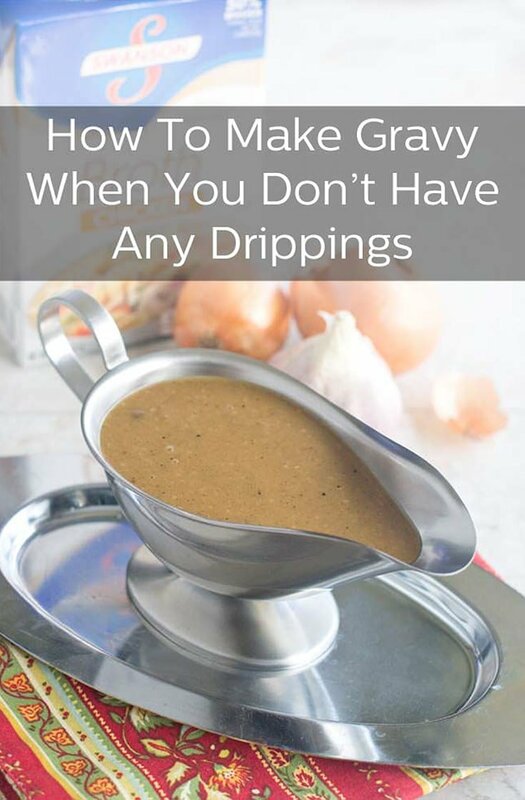 So, the question is, what do you do if you want gravy but you don’t have drippings? To make gravy without drippings you need to find a substitute for that good browned meaty flavor. What you do is brown some aromatics like onions and garlic in lots of butter (for a vegan version of this recipe, head over here). Then whisk in flour and brown that lightly as well. These two browning steps add a good meaty flavor and also get you that quintessential brown gravy color. Finally, go in with a flavorful broth or stock. Today’s easy gravy recipe is not only good for when you deep fry your turkey, or brine it. It’s also a useful way to make gravy ahead of time, anytime. Why use a make-ahead gravy recipe? When cooking a roast dinner, there are a lot of last minute things that need to be done. Gravy making is typically one of them. If you do a make-ahead gravy, you’ve just made those last minutes much easier. But wait, what do you do when the roast comes out and there are delectable brown drippings in the pan? Drizzle them into your pre-made gravy for extra-intense flavor. To do a make-ahead gravy, just follow the instructions in the recipe below and then when your roast is done, pour the drippings from the roasting pan into a narrow jar or a fat separator (sometimes called a gravy separator, there are some pictures of this tool over here if you want to see what it looks like). Let it separate into fat and drippings. Pour off the fat and discard it. Add the remaining drippings to your gravy. You may not want to add all of them because they could thin out your gravy too much. If it does get too thin, there are two things you can do. Either simmer it for a while to evaporate some of the water or make a mixture of 1 tablespoon cornstarch and 2 tablespoons of water. Take your gravy off of the heat, add the cornstarch mixture, stir and then return it to a simmer. If the gravy still isn’t thick enough, you can totally repeat this process several times. Just make sure that you return the gravy to a simmer in between each addition because that is when the gravy is at its thickest. Now you’re all set. Oh, and if you have gravy leftovers after your dinner, don’t throw them away. 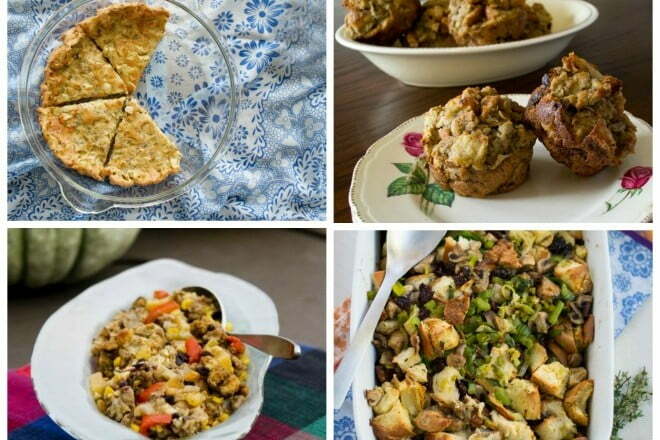 Check out all these amazingly delicious ideas for what to do with leftover gravy. Are you deep frying a turkey and wondering how to make gravy for it? You totally can! You don’t need the roast drippings to make delicious gravy. 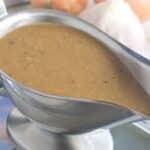 Learn how to make gravy without drippings here. Also, learn how the same technique can be used to make an easy make-ahead gravy so that your roast dinner prep is a breeze. In a large skillet heat the butter over medium heat. Let it melt and get slightly brown. Add the onion and halves of garlic. Cook stirring often until everything is browning a bit but nothing is burnt. Remove from heat. Whisk in the flour. Return to heat and whisk and cook the flour mixture until it is lightly brown. Add the wine and stir to bring up any brownings that are stuck to the pan. Remove from heat. Whisk in the poultry seasoning and then whisk in the chicken broth 1/4 cup at a time, keeping everything smooth as you go. Heat over medium heat to a simmer, stirring often. Strain gravy through a fine mesh sieve before serving. This post originally appeared in November, 2016 and was revised and republished in November, 2018. Oh look a Vegan in the wild. I would like to know how to convert this recipe to a beef without drippings recipe! I think for french fries a beef gravy is what people expect. Thank you. Daren, Great question! This gravy can be made two days in advance. Cover it and put it in the fridge. Bring it out and warm it on the stove over medium-low heat stirring occasionally. Or microwave it 30 seconds at a time, stirring after each time. If a skin has developed on the top while it refrigerates, it will dissolve into the mix as the gravy heats up. Delicious! We always deep fry our turkey, so no drippings. This was very delicious and tasty. No one missed the meat flavoring. Thanks! Noel, Fantastic! Thank you so much for letting me know! Not being ugly, but where else would vegetables be grown except on some sort of farm? Maybe Swanson wants to revisit that “farm grown veggie” tag. And I’m about to use their stock…so I’m not hating. Just observant and interested. In a lab? Thank god I’m vegan… Im not touching the “meat” tag.